E and I started back our weekly dinners in an epic way. 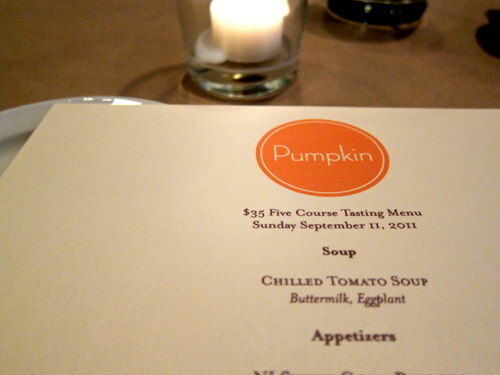 We ventured to south street to dine at Pumpkin for their sunday night five course tasting menu. It was everything we thought it would be, and more! The dining area is small and intimate. There was a big table there, so it was probably a bit noisier than normal. They were russian, had lots of booze, and were having lots and lots of toasts! Since Pumpkin uses as many locally sourced ingredients as possible, their menu does not come out until the day of the meal. I was really excited about what was in store. 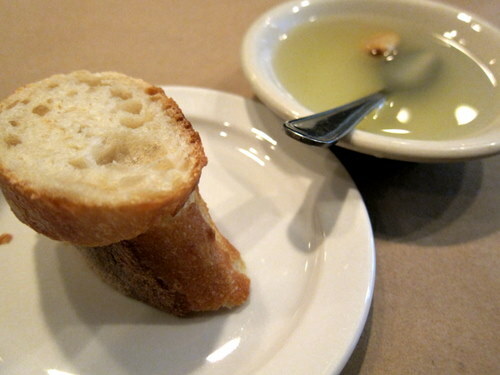 The complimentary bread with garlic infused oil. Yep, even their bread is good! It was crusty on the outside, soft on the inside, and the oil was dreamy. I could have drank it. 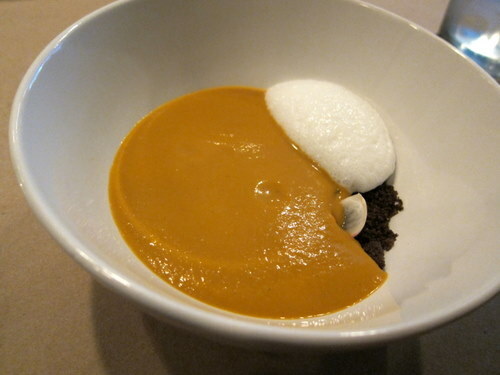 The first course was a chilled tomato soup with buttermilk and eggplant. There was a lot more to it, but I can’t even be sure of the rest of the ingredients. The bowl came out with some veggies (radishes?) and some dark crumbly bits and a white foam. The white foam is probably the buttermilk, maybe? The dark crumbly bits tasted like toast. The server poured the soup into your bowl at the table. I wasn’t even sure how to eat this! Do I mix it together? Do I eat things separately? Do I just make my own combinations? I never quite figured it out but enjoyed it thoroughly. The soup was beyond fresh, I could taste the green! What does that even mean? I don’t know, but that’s how I describe it. It was just damn tasty. The second course for E was the new jersey sweet corn risotto with brandade, leek, and clam. It doesn’t look like a typical risotto. This thing was delicious! 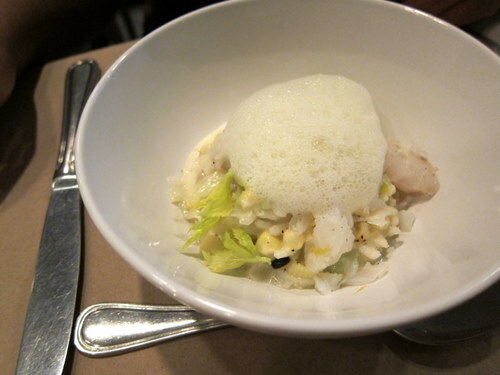 The corn was fresh and sweet, the seafood was a nice complement, and there was foam, again! 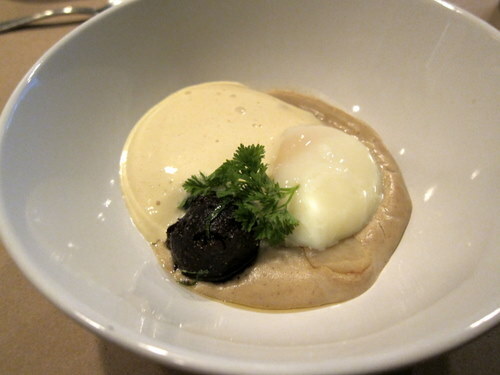 My second course was a free range coddled egg with sunchoke, morcilla blood sauage, and potato. There were two other thick liquids on this dish that I couldn’t really identify. And again, I was at a bit of a loss as to how to eat this thing. So I just took little bits of each area and just made it up as I went. This was incredibly rich and savory. But I liked it all! 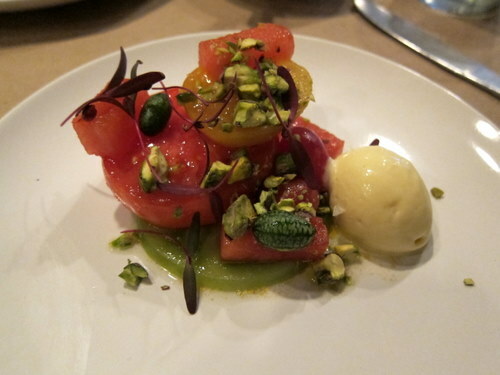 The third course was this beautiful salad of heirloom tomatoes, pistachio, watermelon, and buttered popcorn ice cream. What did I just say? Yes, I just said buttered popcorn ice cream. On. My. Salad. There were several different types of tomatoes, all which were great. There were these tiny little cucumbers that looked like micro watermelons. They were adorable and tasted slightly cucumber-like. The ice cream was a crazy touch, and by crazy, I mean crazy good. It pretty much tasted like straight up butter, but with a slight popcorn taste. The more I ate it, the more the popcorn flavor came out. I’ve never eaten salad with ice cream before. It was an unexpected surprise. 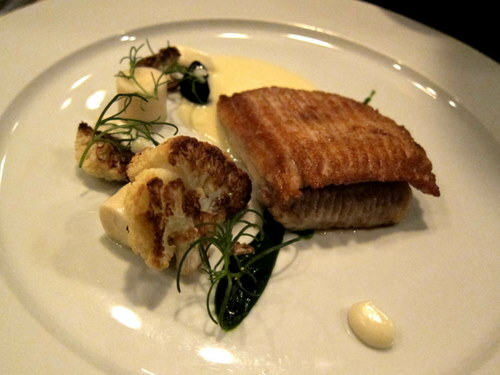 E’s fourth course was the rhode island skate with cauliflower, black olive puree, and a caper sauce. The fish was simply pan fried and was simply delicious. It did not need any adulteration. She particularly enjoyed the cauliflower. 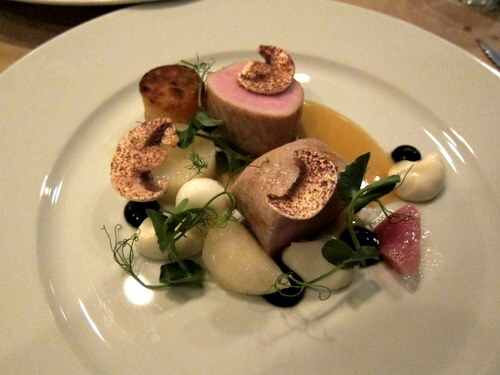 My fourth course was the duroc pork loin with quail egg, turnips, chocolate dusted mushroom, black garlic paste, and horseradish cream. Ok, this is a pretty strong statement, but I’m going to make it. This is the best pork I’ve ever tasted. Ever. I’m being completely serious. Plain and simple. In all honesty, I did not even know that pork could taste like this. It was just perfect. The garlic paste was super savory with a slight asian hint to it, and I loved it with the pork. The turnips were great. The quail egg was a bit of a letdown. It didn’t really have any kind of flavor. It wasn’t even particularly egg-like! 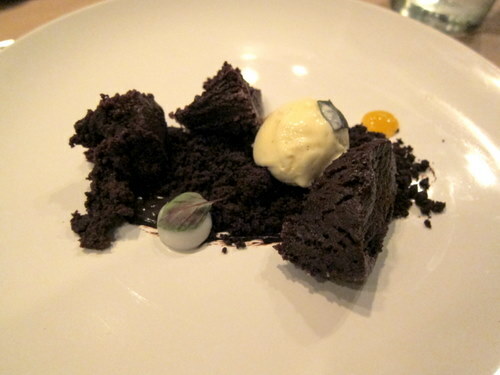 E’s fifth course was the flourless chocolate cake with cardamom, passion fruit concentrate, and coconut sorbet. This thing was rich and creamy and strong! The passion fruit dollop was the most concentrated flavor of passion fruit I’ve ever experienced. 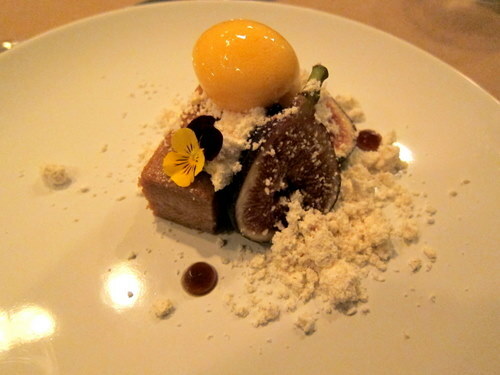 My fifth course was the caramelized white chocolate goat cheesecake with apricot sorbet, fig, and brown butter. The powdery stuff? It’s butter! This cheesecake was awesome, with just the tiniest hint of goat cheeseness (yes, sometimes I make up words). I’m not the biggest fan of goat cheese, but trust me, it’s great. The apricot sorbet was perfect, the figs were mildly sweet. This was truly a meal to remember. Every single dish knocked our little socks off. And I don’t think E and I will ever stop talking about the buttered popcorn ice cream! Service was friendly and excellent. And you know that getting five courses of food of this type of quality and inventiveness is nuts at a price like this. We can’t wait to come back!